APT's two-for-one deal on its Mekong River cruises in December has been extended to January and February departures. The deal applies to eight, 12 and 13-day Mekong River cruise packages on bookings made before December 31. 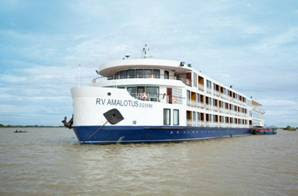 The deal marks the launch last month of the Australian company's new 62-suite ship RV AmaLotus (pictured). The deal price for the 12-day Angkor, Mekong and Ho Chi Minh City package, for example, is from $5345 per couple, twin share, which includes a seven-night cruise, guided excursions on the cruise and at Siem Reap and Ho Chi Minh City, two nights at the award-winning Le Meridien Angkor, two nights at the Sheraton Saigon Hotel and Towers, 29 meals including local wine, beer and spirits with lunch and dinner on the cruise, onboard entertainment, APT Tour Director, port charges, transfers and tipping. Cruising will be on RV AmaLotus or the 46-cabin RV La Marguerite, launched two years ago. Consumer Contact: call 1300 229 804, see www.aptouring.com.au or your travel agent.